Is there an unspoken rule about a woman texting a man first? What choice do you have if he doesn’t seem to be texting you? What’s important to remember is that you should not react emotionally, but have a positive and fun attitude. Men respond the best to women who entertain them via text. Put some thought into your texts and blow his mind. And then…nothing. You wait patiently, a few hours, then a few days. Nothing happens. If you wait any longer it’s going to be an even more awkward conversation. Worst case scenario, he might not even remember you. When a guy doesn’t call you what does it mean? Is it the same thing as a rejection? While it’s possible that he wasn’t that into you, or that he met someone else, it is also possible that he just WANTS you to text him first. Is There a Rule Against a Woman Texting First? There are always going to be some gurus that prohibit a woman making the first move, but in theory if the conversation was going well, you could argue that neither of you is making the first move. Maybe he approached you first and you texted him first, so you’re actually on equal footing. This comes from mostly low self-esteem, as well as a somewhat dated cultural view that only men should pursue women, since a woman pursuing a man is somehow dishonorable. But that’s not true. The only thing a man is concerned about is how a woman makes him feel if she’s making the first move. However, the vast majority of men want to feel attraction, comfort and some degree of trust. So a woman who is usually overly aggressive in texting or pursuing him first should make it a goal to become more feminine and less threatening, even if she does make the first move. Because believe it or not, sometimes a man will not make a move until she leads him to her. Remember these tips before you do anything else. Your poise, confidence and femininity will help you stay on the right track. 1. Do not react emotionally. This will make you seem nervous or clingy. If you want to text him go ahead, but make sure you are calm and curious—nothing more. 3. If he has contacted or interacted with you elsewhere, such as social media or in person, then no, shooting him a text is not a big deal. 4. Do you actually like him or do you just feel obligated to text? If you don’t have strong feelings or attraction for him, there’s no reason to text him. If you do feel something then yes, it’s best to let him know that you are going to meet him at least halfway. 5. Think about how the last encounter went. If you were both flirty and energetic about the first meeting that’s a good sign. However, if there was an awkward moment at the end and you got bad vibes about it, don’t be surprised if he’s holding a grudge. It might be best to text him and see if he’s still upset about something. 6. If you have a special reason to text him, then just do it already! The truth is if you have an excuse (“I’m trying to remember the name of a movie…” or “I just noticed something odd about the other night…”) then you SHOULD by all means take advantage of it. You can approach the situation from a vantage point of, “I just wondered…” which means if he’s not interested you can still save face by treating him as a friend. 7. You can also send him a text freely, without guilt or weirdness, if you find something about him (a photo or a gag) that reminds you of him. This is a safe way of testing his reaction to you. Why Would He Not Text First? This is not as cut and dry a question as you might think. Is it always true that guys avoid texting girls they don’t like? Of course not. Believe it or not, some guys are just really busy—and that’s a good sign that he has a life! It’s a good sign that he’s not sitting by the phone OCD-ing about you like a serial killer. It’s generally a sign that although he might like you, you’re just a friend at the moment. Build on that by having a good text conversation. It’s also possible that he’s going through some life problems or that he has been called away to a top secret NASA mission to guard alien babies. Hey, who knows? What matters is that you don’t take it too personally…and that you don’t psyche yourself out about texting him. As long as you maintain your dignity, there’s no reason to avoid texting him first. Lastly, yes it’s possible he just met someone else or that the attraction waned slightly…for no other reason than just the passing of time. So the ball is left in your court. If you still like him then you can send him an interesting text message and attract him all over again. He may admire your audacity, and your willingness to text him first like you just DGAF. Excuse my millennial slang. It’s all really about attitude. So rather than worrying too much about whether or not to text, I advise my friends and clients to just concentrate on the WHAT, not the IF. If you have something fun, interesting, hilarious or exciting to share with him, just do it. Because believe me, most guys don’t get a lot of interesting texts. If you can make him think or laugh, then you’ll be making a good impression all over again. Hey Buddy!, I found this information for you: "Should I Text Him? 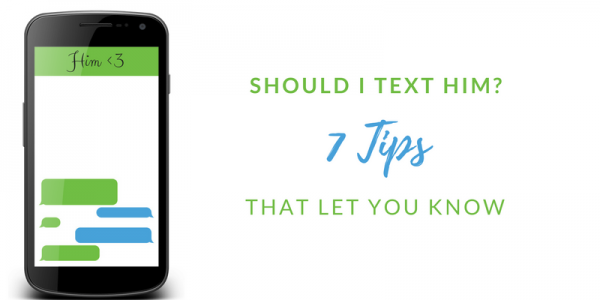 7 Tips That Let You Know…". Here is the website link: https://commitmentconnection.com/should-i-text-him-7-tips-that-let-you-know/. Thank you.